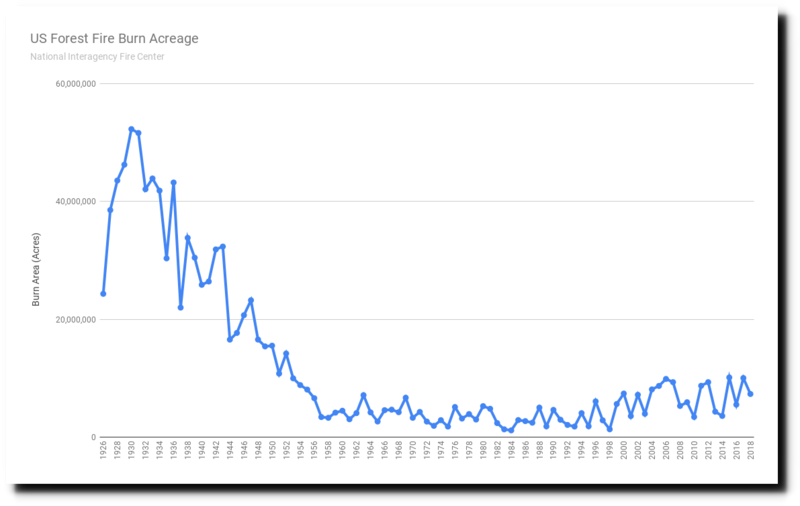 US Forest fire burn acreage so far this year is 40th highest on record, and down 86% since 1930. 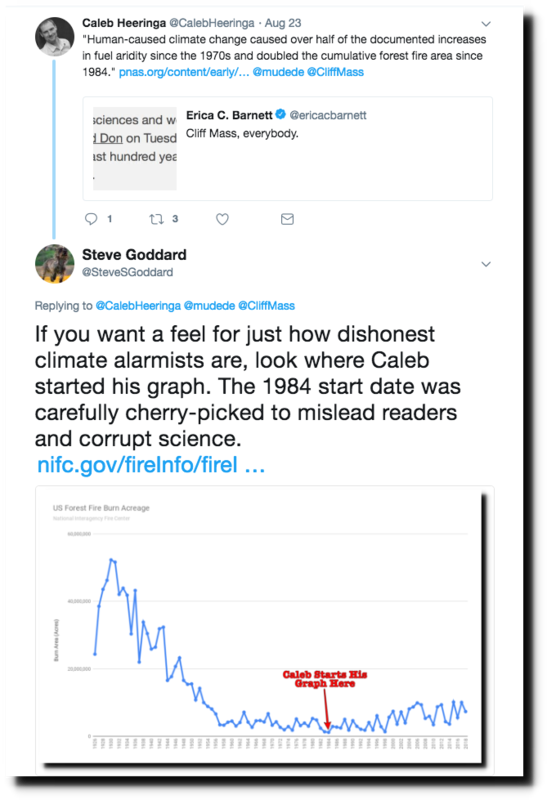 Actual data wrecks their global warming scam, so climate experts simply throw out all data prior to the appropriately chosen start date of 1984. Wait! Our betters have been telling us that increased CO2 results in large increases in water vapor in the atmosphere (and so amplifying the warming). Anthropogenic CO2, and only anthropogenic CO2, forces moisture out of any potential fuel and into the atmosphere for toxic white male positive feedbacks, just as the models predicted. Settled science. that they promoted global cooling at that time. The sky has gotten much brighter since I began keeping record at 6:00 this morning. If this trend continues it will be over 300 degrees in another week or two. I commented to our niece and he husband in Calgary about the cold a week or two ago. He replied that with all his record keeping he has never recorded snow in Calgary. For the left, image and accusation always trumps evidence and truth. Invasive plants are among the most serious problems affecting landscapes and communities across the United States. These plants not only threaten the ecological integrity and biological diversity of our forest ecosystems, but can result in significant negative economic impacts. The result can be loss and destruction of forage and habitat for wildlife, loss of available grazing land, diminished land values, lost forest productivity, reduced groundwater levels, soil degradation, increased risk of devastating wildfires, and diminished recreational enjoyment. In addition, nearly half of all species federally listed as threatened or endangered are thought to be at risk primarily due to the effects of invasive species. Thanks to fossil fuel we can fight wildfires with fire trucks, helicopters and planes. Their media lapdogs that refuse to report the obvious have the utter nerve to claim that they are the “defenders of democracy”. It is more Orwellian than Orwell’s worst nightmare! Has any of the alarmist scientists explained just how climate or weather IGNITES a fire? Do forest fires start by spontaneous combustion, careless, citizens, arsonists or by lightning? This is what NIFC says about fires pre-1983: Prior to 1983, sources of these figures are not known, or cannot be confirmed, and were not derived from the current situation reporting process. As a result the figures prior to 1983 should not be compared to later data. I used to listen to NPR every day for two decades. I stopped abruptly in 2010; a result of my disillusionment. Haven’t listened to that Mockingbird media source since. Tony has produced newspaper scans that I seem to remember have very specific numbers of casualties, acres burned, etc., going back a century. 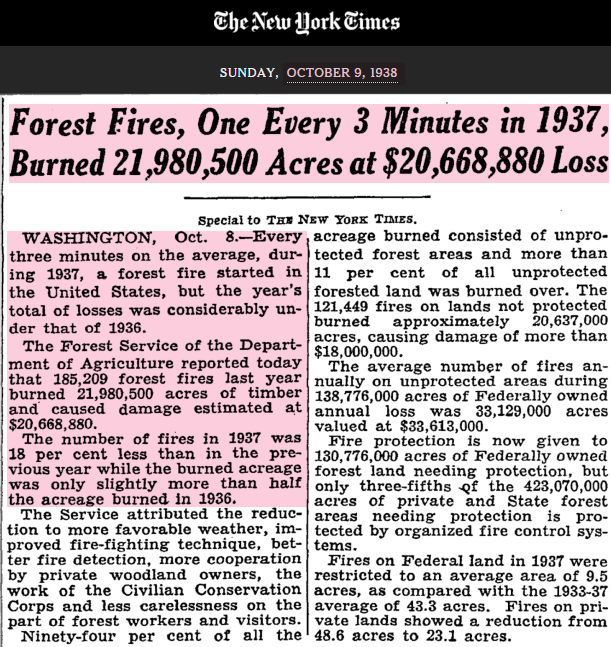 Forest fire numbers from the 1930s are NOT comparable to fire numbers today. The numbers from the 1930s include both wildfire and prescribed fire. The Forest Service only began completely separating them out after about 1954. Your chart looks very different if it begins in 1955; by including the 1930s numbers, you lose all credibility among those familiar with fire numbers. There were a lot more fires in the 1930’s, and your attempt to cover that up with FUD is extremely ugly – but typical of climate alarmists. 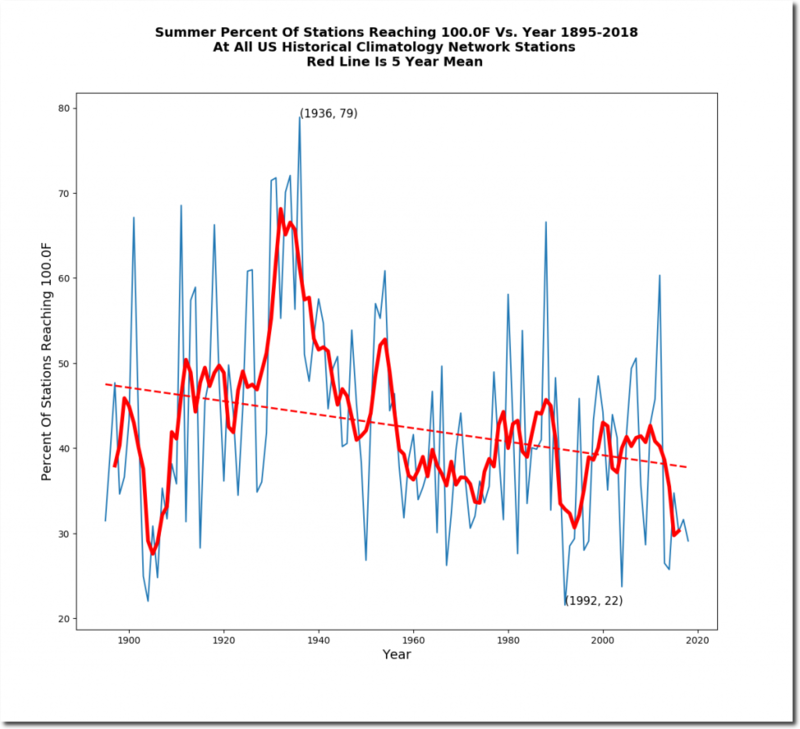 Your comment O-tool, looses all credibility by starting in 1955 and DENYING the large peak in fires in the 1930s. Which just happens to match the extreme high temperatures of the that period. Read Ashley Schiff’s well-regarded book, Fire and Water: Scientific Heresy in the Forest Service, for a history of how and why the Forest Service lied about wildfire numbers and acres in the 1930s and 1940s. No one who knows me would call me a climate alarmist, but I refuse to use bad data to support my views. I have no idea what you are up to, but it is extremely annoying whatever it is.